Singapore native and venture capitalist (VC) Dr Finian Tan believes in defying conventions and cutting through market noise in his investments, all the while retaining an impressive ability to spot unlikely winners. These attributes have enabled him to grow Vickers Venture Partners into Southeast Asia’s largest venture capital firm, which currently manages US$2.5 billion in net asset value. Tan is best known in the industry for being one of the early major investors in Baidu, one of the largest internet companies in China today. This was his first venture capital investment. It would also turn out to be one of his most inspired. Tan credits his acumen to his education and varied career track over the past few decades. “I studied engineering and eventually specialised in the field when I completed a doctorate on the stability of cyclic systems at Cambridge University,” he says. A civil engineer by training, Tan essentially studied how cyclic loading, which refers to the application of repeated forces, causes instability in structures and the soil on which they are built. “In this respect, I have always been a serious tech guy,” he says. Tan completed his tertiary education on a scholarship from Royal Dutch Shell and after he had spent some time working at the university, the oil giant called him into service. “I started out in the operations department at Shell Eastern Petroleum Ltd’s Singapore office. Later on, I became a trader. Eventually, I was posted to Japan, where I was appointed Shell’s chief trader,” he says. It was in the world of oil trading that Tan got a taste of investing. Seeking new opportunities, he took up a position with Goldman Sachs subsidiary J. Aron and Co (Singapore), where he eventually rose to regional director and head of the firm, in charge of Asia-Pacific. The year was 1996 and a young, high-flying Tan was quickly making a name for himself. Not long after, the Singapore government caught wind of his exploits. “In early 1997, I was tapped to be deputy secretary of the industry and trade ministry with the Singapore government,” he says. Tan, who by then had lived and worked in Cambridge, Japan, London and New York, had spent much of his professional career overseas. Needless to say, the call from the Singapore government was a big shift away from the private sector that up to that point had been very good to him. But for him, there was only one course of action when his country came a-calling. “I was just 34 when the ministry asked me to join the public service. When you are asked to do something for the sake of your country, it is a privilege that is very difficult to turn down. It was a real honour for me, being able to take up the deputy secretary post,” says Tan. Part of his role with the ministry was to help transform Singapore into the Silicon Valley of Asia. “I had a great deal of private sector experience at that point, so the government thought I would be the person to lead this. To drive the objective, we made three recommendations to the government,” says Tan. All three proposals were accepted by the government, resulting in him being appointed chairman of all three initiatives. It was here that his love for venture capital really took hold. “Driving these initiatives put me right in the heart of entrepreneurism and venture capital activity in the country. At its heart, venture capital is really a blend of technology and finance. And thanks to my education and career up to that point, I fell in love with it,” says Tan. After serving the government for a few years, he returned to the private sector, joining renowned Silicon Valley venture capital giant Draper Fisher Jurvetson (DFJ) Eplanet Ventures. The firm had made a name for itself as an early investor in the likes of Hotmail, Skype, Solar City and Tesla. The year was 2000 and Tan came on board as the firm’s founding partner for Asia. It was during this time that the global economy was in the midst of the dotcom bubble. “This was a very confusing period. Anything that had a dotcom behind it was going up in value, and irrationally so. I focused on two key themes — supposed opportunities in the dotcom bubble that I did not undestand and what I believed had growth potential,” says Tan. Armed with these truisms, his first foray was a US$7.5 million investment in Baidu, now often referred to as China’s Google. But back then, it was a little-known struggling internet company. “I put in the money in exchange for a 25% stake in the company,” says Tan. This sizeable investment also earned DFJ Eplanet Ventures two seats on Baidu’s board. Tan’s influence at Baidu was such that the other major investors, none of whom was Asian or familiar with the language and business customs, would generally go along with whatever decisions he made. And despite the effects of the dotcom bubble beginning to take shape around them, Tan chose to trust in his co-founders to chart the company’s course for the future. “During my time with Baidu, I found Robin Li and Eric Xu to be incredible entrepreneurs. I think the best thing I did was to believe in them. I supported their decisions in almost all instances,” he says. Then the dotcom bubble burst. But Tan remained defiant in his belief in Baidu and its management. In August 2005, the company was listed on the Nasdaq. “We grew this company from zero revenue to an eventual listing on the Nasdaq. In fact, Baidu’s initial public offering still holds the record as the Nasdaq’s most successful first-day IPO,” says Tan. Baidu closed 2017 with US$13.03 billion in revenue. Its operating profit surged 56% to US$2.41 billion. As at March 13, its shares were trading at US$265.267 each, giving the company a market capitalisation of about US$92.25 billion. As the VC in charge of DFJ Eplanet Ventures’ investment in Baidu, Tan took up his carried interest in the form of shares. “I am still holding on to some of my Baidu shares, but I have also sold some over the years to start Vickers. I don’t have any regrets about selling my Baidu shares because I have multiplied my money with Vickers,” he says. After Baidu, Tan struck a rich vein of Chinese investments. While still with DFJ Eplanet Ventures, he invested in China-based digital advertising company Focus Media. “We made 14 times our initial investment in just a 14-month period,” he says. Tan’s winning streak continued with an investment in Chinese online video game company KongZhong. It netted DFJ Eplanet Ventures a return of 36 times in only 36 months, he says. Bigger opportunities beckoned, especially in the wake of Baidu’s mega IPO. After selling some of his shares in the company, Tan took the plunge and set up Vickers in 2005. Today, he is the firm’s chairman. Having built his firm from the ground up, Tan says that almost all his money is invested in Vickers, or at least in the firm’s venture capital funds. “Our returns are much better than those of most funds out there, so I may as well invest in my own funds,” he quips. One of his early investments with Vickers — real estate investment firm Cambridge Industrial Trust — went on to be a big winner for the firm. The company, which was listed on the Singapore Exchange in 2005, was sold to a joint venture between the National Australia Bank and Oxley Capital in 2008. Vickers made a return on investment of 26 times and hit an internal rate of return of about 190%. Vickers was also an early investor in the now popular Asian Food Channel (AFC). The first pay-TV food channel in the region, it reaches about eight million subscribers in 11 international markets, including Hong Kong, Indonesia, Thailand, South Korea and Malaysia. According to 2013 news reports, Vickers made an exit with a return on investment of “well over 100%” when AFC was snapped up by American TV network Scripps Networks Interactive. The lifestyle media platform, which has been around for more than 130 years, also owns the Food Network and the Travel Channel. occurrence in the venture capital game. He acknowledges that about a third of the firm’s investments fail. “This is not bad as the industry failure rate tends to average about two-thirds. Nonetheless, it is very humbling to have a third of what we believe in not come through,” he says. The Singapore-based company, which works on a business-to-business-to-consumer basis, offers enterprise clients mobile wallet solutions that they can offer their customers. These include peer-to-peer (P2P) transfers, cross-border remittances, top-up channels, virtual payment cards and loyalty and rewards programmes. Another pain point that Tan is looking to tackle is Asia’s love of plastics. “Food wrapping paper is normally coated with a plastic coating called polyethylene. The problem is that these polyethylene-based wrappers are non-biodegradable,” he says. Vickers’ generalist approach to Southeast Asia has also allowed it to pick up on interesting regional outliers, with a Malaysian start-up in particular attracting investment dollars. “We have more than a 10% stake in a Malaysian company called KPISOFT and our plan is to have it listed on the New York Stock Exchange in the next quarter. This company solves a pain point and has technology with far-reaching business applications,” says Tan. KPISOFT is a Kuala Lumpur-based performance analytics company that utilises artificial intelligence to provide company bosses with real-time insights into the performance of individual staff such as sales targets. The software is able to capture very granular data, which it then feeds into a mobile app. “As far as the listing is concerned, it is not necessarily an exit for Vickers as we generally have a very long-term view of the companies we invest in,” says Tan. On the wider venture capital scene, he is banking on what he refers to as deep technology sectors in developed economies. He says that unlike the sharing economy, fintech or e-commerce, his investments in nanotechnology, biotechnology and life sciences are backed by comprehensive intellectual property protection. That means the products are difficult for competitors to reproduce. “We are most interested in these sectors from the advanced economies because they are growing exponentially. For example, the microprocessor technology we see in smartphones is advancing at an exponential rate,” says Tan. Of all its developed-economy investments though, Vickers’ top performing sector is biotechnology, where it has achieved a multiple of more than 10 times. This is largely due to San Diego-based regenerative medicine start-up Samumed LLC. Vickers first backed the company, valued at US$12 billion today, in 2012. Tan and his partners currently own more than 10% of the biotech unicorn. Samumed is developing groundbreaking regenerative therapies meant to reverse and ultimately cure things such as the potentially lethal lung disease idiopathic pulmonary fibrosis, osteoarthritis and advanced solid tumours as well as preventing wrinkles and hair loss. Vickers is the only venture capital firm to have backed the biotech start-up. The company’s other investors include sovereign wealth funds and family offices. Tan advises investors not to underestimate venture capital as it remains an attractive asset class under the right conditions. “It is important to note that the median VCs lose money. It is the top quartile of VCs that make 90% of the returns. However, most of these top quartile VCs are closed off to new investors,” he says. Vickers Venture Partners recently announced the opening of its Kuala Lumpur office, a move that marked the Southeast Asian venture capital giant’s foray into Malaysia. 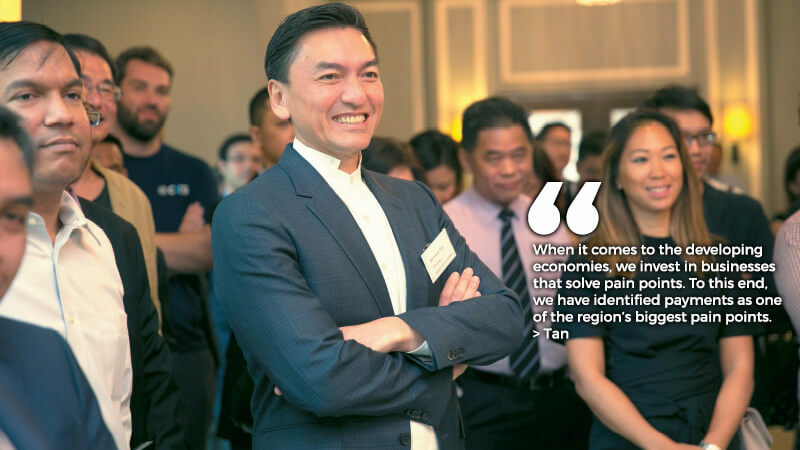 According to co-founder and chairman Dr Finian Tan, Vickers is setting up shop in the country because it intends to use the local market as an early test bed for business ideas and subsequently as a launch pad into the rest of the region. Malaysia’s relatively modern infrastructure, coupled with a population that is representative of the wider Southeast Asia, makes it an attractive base outside Singapore. The KL office will be headed by Tan’s brother, Dr Damian Tan, while Vickers associate director Wei Luo will be based in-country. The office will be the firm’s fourth international base after Shanghai, Hong Kong and New York. Although Singapore has long been the regional investment coordination hub for venture capital, it is not a representative test bed for Southeast Asia, says Tan. “It is a city state of just five million people, with a per capita income of US$55,000. Tan observes certain similarities in consumer behaviour in Malaysia and the rest of the region. “So, I think if a company succeeds in Malaysia, it could do well in Indonesia, the Philippines and so on,” he says. The move comes only a few months after Vickers raised its fifth venture capital fund — of US$230 million — in October last year. 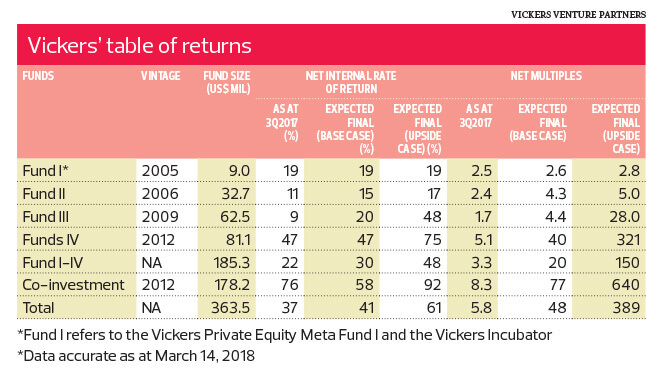 Tan tells Personal Wealth that the fund, which is Vickers’ largest to date, also saw the investment of a prominent Malaysian institutional investor. In fact, there is a larger objective here. Tan wants to stay ahead of the curve in what he sees is an increasing amount of geographical segmentation in Southeast Asian venture capital money. This is down to the fact that the regional venture capital industry is maturing, he says. As more money becomes available in the fast developing economies of Indonesia, the Philippines, Vietnam and Myanmar, Tan says maintaining a presence in Singapore alone will not keep Vickers atop the Southeast Asian deal flow pile for much longer. So, although he thinks Singapore will continue to be a regional investment coordination hub, he anticipates a growing number of deals being completed in their countries of origin.